​With training, Law Enforcement Officers should be able to benchmark 1.5 seconds as a standard to draw their firearm from an open carry holster and place a shot on target at 20 feet. That's pretty impressive! 1.5 seconds, bang! 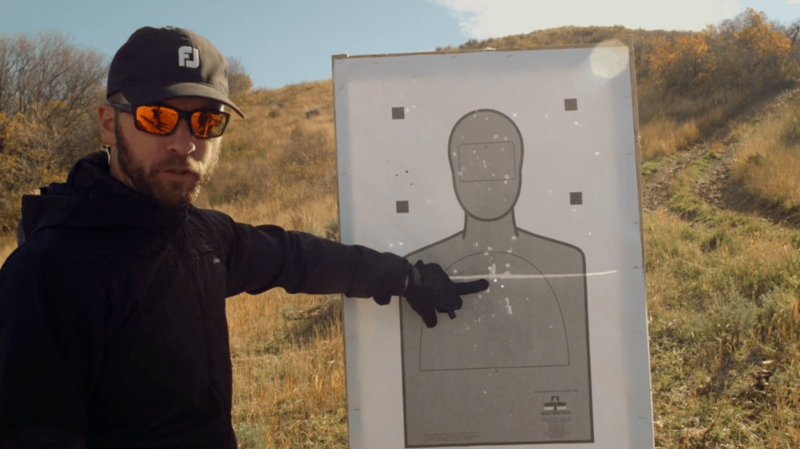 Krav Maga Training and The Tueller Drill - Bring a knife to a gunfight?! Years ago, the police wanted to test this standard, and created exercises to see how much distance could be covered in 1.5 seconds. The goal was to draw attention to when officers should begin to identify potential threats. Little did they know, this exercise would go down in law enforcement history as the Tueller Drills, where they surprisingly (and shockingly!) found that a charging attacker could actually cover upwards of 20 feet in that same 1.5 seconds! Woah! Red flag! 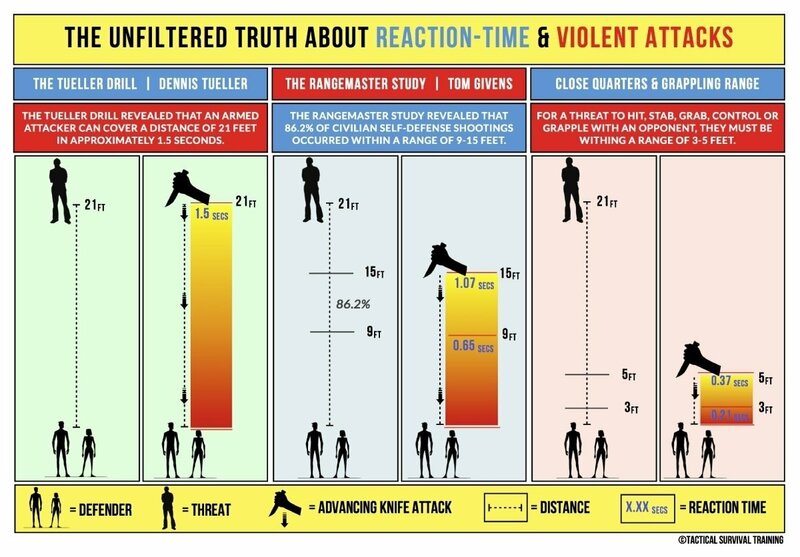 Are you saying that the time it takes to draw a firearm and place a shot at 20 feet, that same 1.5 seconds can allow a charging attacker to strike, grab, or stab from a distance of 20 feet!? That's scary! You know that saying, "Don't bring a knife to a gunfight." Well...maybe we should revise that to..."If you are within 20 feet, it might be BETTER to bring a knife to a gunfight!" Needless to say, this was alarming to the law enforcement community. They worked on reducing the draw time (even by just a fraction of a second) and increasing the total distance. Officers were taught to identify potential threats earlier, sidestep while drawing, or take steps backwards while drawing, all to create that little, tiny, but very important advantage. Remember, these are police officers, who train repeatedly for these worst case scenarios...not the common citizen interested in self-defense. What can we do? We can learn to be more alert, and to assess potential threats more vigilantly. We can learn to fast draw our firearm, take a sidestep to get off the line of attack, or take a retreating step to create distance. But really, what are we gaining?...tiny fractions of a second? Will it really make a difference? Can you really remain in a state of ultra alertness all the time? 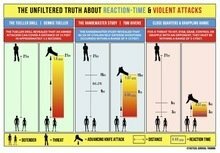 Add to that the real attack feelings of shock, adrenaline, fear, confusion, even denial...and you are way past 1.5 seconds. Our recommendation? Get some real, hands-on self-defense Krav Maga Training. Rather than working on reducing the 1.5 second draw time, work on techniques that can actually "create" time. A well placed vertical front stop kick, or a well timed sidestep and shove off, can "create" that 3-4 seconds you need to properly assess the situation. From there, you can decide to continue the attack, draw your firearm, or even flat out retreat!...at least now you have options. The only way to get a feel for distance and just how fast it closes, is to drill it. Remember, your goal here isn't to decrease your firearm draw time. If 1.5 seconds is the police standard, we aren't going to get much faster than that. Our goal is to increase the time and space we have to assess, react, and make decisions. ​Start slow, work all three phases of the drill at a slow walking speed. On the next cycle, increase the overall speed to a fast walk, then maybe a jog, and finally try it with a flat out charge. Your training partner should be holding a Buckler Pad or some other large kick shield. Phase 1.) Get Off the Line - Your training partner should advance towards you (zombie fashion) in a straight line. Your goal is to sidestep just as your partner enters striking range, taking yourself off the advancing line. As you sidestep, your training partner will continue in a straight line, passed you. Remember to pivot and turn, so as to always be facing your threat. Phase 2.) Stop the Advance - As your training partner turns to face you and restarts the advancement (still in zombie fashion) your next act is to stop the momentum. You can do this with a palm strike/push-off to the training partners chest. When you want to stop mass and momentum, you need to remember to hit/push center mass. Phase 3.) Go to Combatives - As your training partner still continues to advance, you now have to do something more drastic. You've tried side stepping. You've tried to stop the advancement. None of that is working and you still feel threatened...it's time to decisively end this. A Low Front Kick to a Vertical Target (aka groin kick) will usually do the job. As part of the drill, your training partner should be holding the Buckler Pad/Kick Shield down low, to allow you to throw the kick. At the completion of Phase 3, you can make the decision to run away, continue the attack with further combatives, or use the time gained to draw your weapon. As a matter of safety, we recommended you do not end Phase 3 with a full force front kick when running the drill any faster than a brisk walk.